Dr Kevin Bonham: Poll Roundup: What Is Going On With Newspoll Preferences? Over time it's been apparent that it's not only the methods that have changed, but also some properties of the polling. In the leadup to previous federal elections, Galaxy's polls (which were very accurate) had been noted for their uncanny lack of volatility. Once Malcolm Turnbull's honeymoon bounce as PM was out of the way, it soon became clear the new Newspoll shared this characteristic. 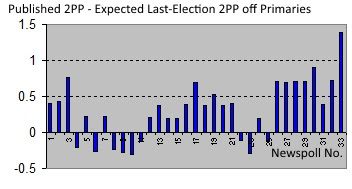 As former Nielsen pollster John Stirton mentioned, Newspoll has been so steady (with an average poll-to-poll 2PP change since the election of just 0.7%) that it has been hard to avoid speculating Galaxy does something to reduce the risk of rogue results to below what would be expected randomly. But now, there's more, because it appears to be the case that Galaxy has taken Newspoll away from the purely last-election-based preferencing method that the brand had used continuously from 2005. This follows similar behaviour by the pollster in the leadup to the 2017 Queensland election, in which Galaxy-run statewide polls used averages of preference flows from multiple previous elections to try to predict how preferences might flow. One consideration here was the unusually pro-Labor behaviour of Others preferences in Queensland in 2015, and another was that Queensland had switched from optional to compulsory preferencing. The changes helped, but they were generally not very clearly documented. The first two Newspolls in this sequence were taken before the 2016 election preferences were available, and when the third was taken they were only just available. After those three, the average difference was a probably trivial 0.11 in favour of the Coalition until Newspoll number 26 (early December 2017). From number 26 onwards, the average difference has been 0.77 points. On a poll-by-poll basis, even differences of up to 1.2 points between the published 2PP and the expected 2PP off the published primaries may not mean anything. This was discussed in microscopic detail in this Wonk Central piece. Say the published primaries in a poll would normally give 52.1 to Labor, but the published Labor and Green primaries had actually been rounded up by nearly half a point, and the published Coalition and Others primaries had been rounded down by the same amount. That could mean the 2PP from the unpublished, pre-rounded, primaries was really 51.45, and on that basis the published Labor 2PP would be 51. What we have in the case of the current Newspoll, is published primaries that would normally give a 52.4% 2PP for Labor, but a published 2PP of 51. Rounding can't account for a gap quite this large by itself, but at a big stretch some combination of rounding and state-by-state preferencing impacts might do it. Even so, it would be an extremely rare event (and that's assuming any pollsters still use state-by-state preferencing, and I cannot say for sure that any do). What's happened since December is a sudden series of mostly large differences in the Coalition's favour, commencing immediately after the Queensland election at which One Nation preferences flowed strongly to the Coalition. (Also, commencing the week before it was announced that YouGov had acquired Galaxy, for anyone who might think there could be anything in that.) As William Bowe notes, what we've seen is what we would expect to see if Galaxy had suddenly changed the One Nation preference allocation from 50.5% to Coalition (the 2016 value) to something like 60%. That also exactly matches my average difference estimate above. I have seen reports that Dennis Shanahan said Newspoll had actually switched to respondent preferences, but at this stage I doubt it has. Indeed I've had what I am taking as a degree of informal confirmation that there has just been a change in the allocation of One Nation preferences. Could this run of bullish published 2PPs for the Coalition off the primaries as published have happened by chance? Seems hugely unlikely, but I had a quick go at simulating it. I ran a Monte Carlo of 2150 randomised Fakepolls with the same average primaries as the current Newspoll and a sample size of 1621 fake voters each, and only 8% of the Fakepolls had differences over 0.7 in the Coalition's favour in this regard. Yet this has now happened in seven in the last eight real-world Newspolls, which would come out as about a one in 10,000,000 chance at that rate. Throw in weighting, special modifications, scaling, state preferencing and whatever else you like and you could knock a couple of zeros of that, maybe, but it's still going to be a very unlikely event. And by the way, the average poll-to-poll published-2PP shift in my Fakepolls is 1.2 points, nearly twice that in Newspoll, even though nothing whatsoever happened in underlying voting intention in the 110 fake years I ran them over. This further confirms that the current Newspoll is under-dispersed, as Essential was in the 2010-3 term. Why might such a change have happened? Only 50.5% of One Nation preferences flowed to the Coalition nationwide, but this is lower than the flow at past federal elections (generally in the mid to high 50s) and much lower than at the WA and Queensland state elections (60-40 in WA, 65-35 in Queensland). With One Nation regularly polling around 7%, and with disgruntled Tony Abbott supporters still attracted to the party, no-one seriously believes that One Nation preferences would flow anything like as weakly as 50-50 in an election held "right now". Election day when it comes about could be a different story. So it can well be argued that last-election preferences are currently a bit favourable to Labor and that a more accurate predictive model should adjust for this at least for the time being. This should be argued with some caution, because the track record of last-election preferences is incredible. And the example of Queensland 1998 (with a much stronger One Nation preference flow to the conservatives than seen at federal elections around that time) should show that state elections aren't always good models for federal preference flows. But changing the One Nation preference allocation is at least a reasonable and perhaps even a good methods decision. It is quite silly to say such a change would have been made to advantage the Coalition, and if anything a pollster that continued using only last-election figures without any acknowledgement of the One Nation issue at all might be accused of stacking the deck against the Government. (Certainly, using exact last-election preferences for so long was no help in breaking the "30 losses" streak). Normally, I find it depressing to be of the same species as those who entertain Newspoll conspiracy theories. But in this case, while the conspiracy theories are as clueless as ever, I feel that someone out of The Australian, YouGov or Galaxy, or some combination of the three, may have brought this situation on themselves. While announcing the change (whatever exactly it was) at the time publicly would have caused some people to claim the change was being made to try to help PM Turnbull break his losing streak before it got to 30, it would have been a better look than making a publicly undocumented change which would sooner or later be inferred from the evidence anyway. The minor controversy about Newspoll preferences (and the lack of detail concerning them) comes at a mildly interesting time in federal polling - the Coalition seems to be recovering significantly. However it is not unusual for struggling governments to get a run of more benign polling at some stage only to regress to the mean or worse thereafter - eg Labor in late 2012. So it remains to be seen if there is any substance in this shift or if it is just another modest resurgence like the one early last year. In aggregating Newspoll, I'm assuming for the time being that all they've done is altered the flow of One Nation preferences, and on that basis I've come up with a rather complex method for finding a last-election 2PP for Newspoll. So for the current poll, the primaries would normally imply, on average, 52.4 by last-election preferences. But even after changing the flow of One Nation preferences, they would still convert to something that rounds to 52. This implies that the primaries are actually a little stronger for the Coalition than the rounded version, and that Newspoll were probably looking at something around 51.3 which they then rounded to 51. (Of course, if they've actually switched to respondent preferences, all of this is irrelevant). So on that basis I've fed the Newspoll into my aggregate at 52.1 to ALP. In terms of primary votes, the main reason that this poll rounded to 51 instead of 52 by whatever methods Newspoll now uses is that the Greens are down a point. The overall trend is more important than the one-point shift in the latest Newspoll. The Coalition is in its best position for fifty weeks - things were last this mediocre for them just before the 2017 Budget. The 2017 Budget was supposed to free the government from bad polls thanks to the powers of the mighty "budget bounce", which the Coalition placed great hopes in despite the evidence that budget bounces are very rare events. In fact the Budget marked the end of a brief rally and things got gradually worse for the rest of the year. It's amazing what difference a single competitive Newspoll makes. Only last fortnight the Prime Minister was dissing Newspoll and saying it couldn't be trusted after failures in recent elections (one of the examples being Tasmania, where it actually wasn't in the field at all!) Now suddenly "the political contest in Australia is very close". There is even talk that the government might scoot off to an election a year early to avoid the worst of the redistribution* (and clashes with state elections, Easter, school holidays, etc) should its Budget succeed in producing a bounce. (Has nobody heard that you can't bounce an election? Or what voters think of being dragged to the polls a year early for no remotely fathomable reason?) We are also starting to see waffle about the mythical concept of polling "momentum", and journalists have even invented the concept of a "pre-budget bounce" (spare me). On net satisfaction, PM Turnbull is up eight points to -17 (36-53) and Bill Shorten is up five to -20 (34-54). Neither has cracked 40% satisfaction since the election, and the 33-poll streak of sub-40 results for both leaders at the same time is the second longest ever. (Gillard and Abbott had 44 in a row like this.) Turnbull's lead as better PM (38-35) is now rather meagre given the Coalition's improved 2PP, contrary to his past habit of polling large leads while the 2PP was bad. Issues polling this week had a strong focus on immigration issues. Essential found a marked increase in the level of concern about immigration compared to in 2016 (bearing in mind that Essential tends to show higher levels of concern compared to some other polls, as noted by the Scanlon Foundation (PDF)). Overall, Essential found 64% thinking there had been too much immigration in the last 10 years and only 5% too little. In Newspoll, 56% said Australia's current target level was too high and 10% said it was too low. Essential also found the curious result that Greens supporters were a little less fussed about population growth than the major parties. Although the sample of Greens voters would be small and the differences hence not significant, it's not that long ago that Greens supporters tended to be the first to argue strongly against population increase - especially in Australia which they argued to be a fragile continent - on environmental grounds. What has happened there within the green movement is that the old zero-growth or negative-growth approach has largely come to be seen as synonymous with low immigration and hence with anti-refugee attitudes. Supporting refugees is these days a strong marker of difference among Greens politicians and supporters so they're nowhere near as likely to complain about population growth as they used to be. It should be noted that Howard is slightly disadvantaged by Newspoll's use of respondent preferences around the 2004 election. If these are replaced with estimates, his loss rate drops to about 123/294 (42%). For the purposes of all this stuff and to keep attribution simple for the Fact Check folks I recalculated my own last-election 2PPs for all the Newspolls from before 2005. These are generally similar to Peter Brent's dataset that I have used a lot in the past, but here and there there's a point or two of difference. "A quick comment about the issue of minor party preference flows. Our longstanding policy has been to look at previous election preferences and use those to calculate 2PP figures. This has not changed." "The 2PP figure is determined based on the mix of the minor parties and their preference behaviour at recent elections. This is entirely the prerogative of YouGov Galaxy and not any other organisation. Our track record at federal and state elections speaks for itself." The reference to "recent elections" (plural) confirms as suspected that Galaxy's preferences in this instance are not based solely on the 2016 federal election, as has been falsely claimed by The Australian for what appears to be at least the last five months. The tweets also confirm that the speculation about Newspoll being switched to respondent preferences was (fortunately) wrong. Pollbludger article on historic One Nation preferences, which among other things notes that the donkey vote in Paterson (NSW) was in fact a bigger influence on the One Nation 2016 preference split than the Longman situation. Thanks for the excellent summary of the latest (and previous) poll results. Your blog is now my preference, since Antony Green's has had comments disabled and does not appear as frequently. So is news poll underestimating by 1%....on an averaging of polls how does this compare.....really a slight lnp improvement? The best figure to compare the Newspoll with is the One Nation adjusted aggregate figure, currently 51.8. Probably the Newspoll was something like 51.3 on that basis, but that's a slightly generous reading compared with other recent polls. The trend is in NP moving the ON preferences. Great article once again (makes my pittance of a donation worthwhile). Something I have wondered about lately is, what would the make up of our government look like if there was FPTP and optional voting? I'm not advocating either btw, just curious. Before anyone says I could work this out with the available data, I'm happy when I press the right button and the box of tricks fires up such is my knowledge of computers. Possibly quite similar, but with fewer if any crossbenchers. As with nations that have FPTP, minor-party voting would be greatly suppressed and voters who would otherwise vote for minor parties would tend to vote strategically for the majors - that would effectively fast-forward the 2PP contest. Those who oppose optional voting in Australia say it would favour the conservatives, but I don't think countries that have it really support that theory. Perhaps there would be slightly more conservative approaches within each major party but over time they would be equally competitive. Wasn't it their 60th consecutive loss--30 apiece? No. Contrary to the very widespread myth on social media, the 60 were not consecutive. Between Abbott's 30 losses and Turnbull's 30 (now 31) losses came Turnbull's first 20 Newspolls which included 9 wins, 7 ties and 4 losses.